We had met Peter Yarrow at the Café Wha? in Greenwich Village a year earlier. We sang nightly, sharing the proceeds of the hat at the door. Peter and I had formed a friendship, and I had gotten him a gig replacing me in an Israeli folk-dance group as the guitarist and singer when he first hit town. I taught him the Hebrew words phonetically. Peter Yarrow is pure folksinger top to bottom. I remember marveling at him when he’d solo at the Wha?’. Once he started singing, the funny looking Jewish kid on stage disappeared and was replaced by a magical minstrel. If I ever had dreams of following the musical footsteps of my hero Pete Seeger, I was sure that Peter Yarrow would be in front of me in the line. Now, Peter was in the process of forming his new group. Folk music was spreading and money was hunting for talent. No wonder Albert Grossman singled Peter out and paired him with Noel Stookey. Noel was also a regular at the Wha? and his comedy, rich voice, and sure-footedness on stage made him a natural. But they needed a girl to round out the package. I remember having been impressed by Mary Travers after seeing her at a midnight concert at one of the local Village theaters a few weeks earlier. So one night, while Peter and I sat at the bar at Minetta’s Tavern across the street from the Wha?, he asked me if I knew any girl folk singers for his new group, and I suggested he look up a gal by name of Mary Travers. Now let’s be clear. I have no idea whether he looked her up right then, later, or because of me at all, but sooner or later they found each other. That was the way things happened. Back then we were all just a bunch of random ingredients in a big stock pot called the “folk scene” and who knows now who was responsible for what? Things happened the way they were supposed to happen I suppose, and it’s a lucky thing because otherwise there’d be jerks standing on stage every night taking credit for discovering Elvis. Actually, there are. Anyway, back to the apartment on Fifth Street. Peter grabs a guitar, unfolds a sheet of paper with words on it and sings Puff The Magic Dragon. “What’s so controversial?” we ask. That’s how naïve we were. I guess there was some question about hidden meanings for some people but to us it was just a sweet folk song and we always thought so. Knowing Peter as I did then, I still think so. We loved the song. I mean l-o-v-e-d the song. Not even a question. Within a day, we had an arrangement, and within two weeks we were singing it at Mike’s Pub on Pearl Street in Boulder, Colorado. It became our theme song. An exchange student at U of C translated it into Swedish. I’ll post it if I can ever find it. A month later at a sold-out concert at the University in Boulder, we sang it, and at the time we had no idea someone was recording the concert. There’s a link to that recording at the bottom of this column. We headed for Los Angeles, stardom and summer in our dreams. Los Angeles – The Troubadour, The Ice House…. 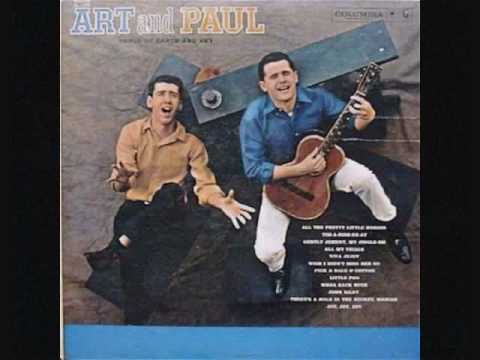 Art and Paul and their hit song Puff The Magic…. Fans eager to hear it. Next time you are at The Coffee Gallery in Altadena, ask Bob Stane. He remembers. He was there. I was standing near the back door of the Troubadour in Los Angeles waiting to go on stage with Paul. Dickie Davis was holding the black pay phone receiver (remember them?) in his hand. And that was that… just like that. PS: I joined Peter onstage in Arizona in 2015 and we performed Erev Shel Shoshanim together. It was the first Hebrew song I had taught him in 1961. He remembered every word. Art Podell was one half of the iconic Greenwich Village duo Art and Paul before moving to L.A. in 1961. An original member of the New Christy Minstrels, Art wrote songs for many of the artists of the day. He continues to perform and write and he rotates as a host of KPFK’s Roots Music and Beyond. Check out artpodell.com.